In the FT’s Economists’ Forum, Benn Steil wrote a stimulating piece in which he argued that Keynes was wrong. His argument is that interpretations of Keynesian economics are all based on the assumption that wages and prices are sticky. But wages and prices are not sticky. Ergo - Keynes was wrong. Mr. Steil and I are in complete agreement that the Keynesians, interpreted in this way are, to use a technical term, out to lunch. But that does not imply that Keynes was wrong. At least not entirely wrong. Far from it. My emeritus colleague, Axel Leijonhufvud, made a distinction in his 1966 book, on Keynesian Economics and the Economics of Keynes, between Keynes and the Keynesians. He meant that orthodox Keynesian interpretations of the General Theory, that began with influential papers by John Hicks in England and Alvin Hansen in the US, got it all wrong. Keynes said three things in the General Theory. First: the labour market is not cleared by demand and supply and, as a consequence, very high unemployment can persist forever. Second: the beliefs of market participants independently influence the unemployment rate. Third: It is the responsibility of government to maintain full employment. He was right on all three counts. But he was wrong about something else. Keynes thought that consumption depends on income. Two decades of research on the consumption function, following world war two, led to a different conclusion. Consumption, and this is two thirds of the economy, depends not on income but on wealth. This is no small matter: the theory of the multiplier and the implication that fiscal policy can get us out of the current crisis rests on exactly this point. Where does this leave us? Keynes was right about three key points. 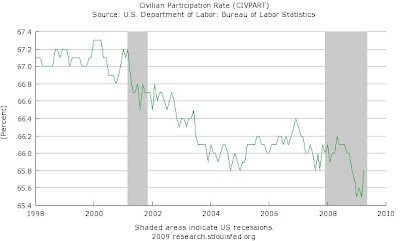 1) High unemployment can persist forever because the market is not self-correcting. 2) Confidence matters. 3) Government can and should intervene to fix things. But the orthodox Keynesians are wrong: fiscal policy cannot provide a permanent fix to the problem of high unemployment. We need a new approach that directly attacks a lack of confidence in the asset markets by putting a floor and a ceiling on the value of the stock market through direct central bank intervention. Offhand, it seems to me that using monetary policy to prop up the stock market is not so radically different from increasing "M" in the textbook model. The transmission mechanism is different: Farmer would have the central bank buy stocks, instead of bonds, as it does in conventional open market operations (or instead of dropping money from helicopters, or burying it in bottles...), but the end result would still be an increase in nominal demand. I suspect I may be missing something - Farmer had limited space to make his argument and the "textbook" Keynesian framework is pretty engrained in my thinking, so it is hard for me to think of these issues outside of it. I'll look forward to the longer version in his forthcoming books. 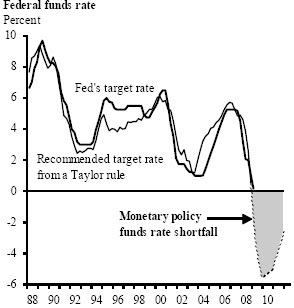 Toward the end of 2008, the recession deepened with the prospect of a substantial monetary policy funds rate shortfall. In response, the Fed expanded its balance sheet policies in order to lower the cost and improve the availability of credit to households and businesses. One key element of this expansion involves buying long-term securities in the open market. The idea is that, even if the funds rate and other short-term interest rates fall to the zero lower bound, there may be considerable scope to lower long-term interest rates. The FOMC has approved the purchase of longer-term Treasury securities and the debt and mortgage-backed securities issued by government-sponsored enterprises. These initiatives have helped reduce the cost of long-term borrowing for households and businesses, especially by lowering mortgage rates for home purchases and refinancing. 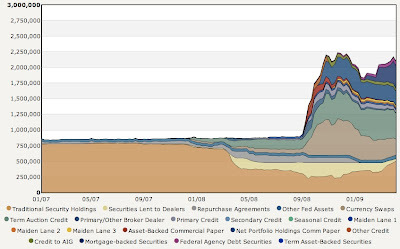 In terms of overall size, the Fed's balance sheet has more than doubled to just over $2 trillion. However, this increase has likely only partially offset the funds rate shortfall, and the FOMC has committed to further balance sheet expansion by the end of this year. Looking ahead even further over the next few years, the size and persistence of the monetary policy shortfall suggest that the Fed's balance sheet will only slowly return to its pre-crisis level. That is, the usual adjustments to the Fed funds rate affect the short end of the yield curve (the relationship between interest rates and maturity of debt), but now the Fed is creating money to buy longer-term securities. Because bond prices and yields move in opposite directions, this should reduce rates further along the curve. Speaking in UAE, the world's third-largest oil exporter, Krugman said Japan's solution of export-led growth would not work because the downturn has been global. "In some sense we may be past the worst but there is a big difference between stabilizing and actually making up the lost ground," he said. "We have averted utter catastrophe, but how do we get real recovery? "We can't all export our way to recovery. There's no other planet to trade with. So the road Japan took is not available to us all," Krugman said. Global recovery could come about through more investment by major corporations, the emergence of a major technological innovation to match the IT revolution of the 1990s or government moves on climate change. "Legislation that will establish a cap-and-trade system for greenhouse gases' emissions is moving forward," he said, referring to the U.S. Congress. "When the Europeans probably follow suit, and the Japanese, and negotiations begin with developing countries to work them into the system, that will provide enormous incentive for businesses to start investing and prepare for the new regime on emissions... But that's a hope, that's not a certainty." That's an important point. Critics of meaningful measures to deal with global warming have focused on the costs of dealing with the problem. These costs are often overstated, and the people making this argument seem to underestimate the ability of market economies to adjust to the changes in relative prices that would be induced by cap-and-trade or carbon tax measures. Part of that adjustment will involve replacing some of the capital stock - from air conditioners to power plants - with more efficient equipment. A policy that credibly commits to raising the relative price of carbon in the future therefore could increase demand today. In the Keynesian model, this would shift the investment demand function, which would also shift aggregate demand, and help close the output gap. Particularly the midst of a global slump, the need to create jobs provides an argument in favor of taking serious action on global warming now. As for the actual legislation moving through congress, the Waxman-Markey bill, Krugman sees it as a step in the right direction, but The Economist is disappointed. (Krugman's reference to Japan is to the export growth which helped get it out of its 1990s slump; as I noted recently, its reliance on foreign demand is getting it in trouble again now). One reason I frequently return to Brad DeLong's blog is that he occasionally digs up nuggets like Keynes' review of Trotsky's book on England. Both men were capable of writing with cutting wit; this is on display in the passages Keynes quotes from Trotsky and in his response to them. Fortunately, eighty years later, it appears that it was Keynes, not Trotsky, who was right about history (though some might say it is too soon to tell). Japan confirmed Wednesday what many had long suspected: that the world’s second-largest economy contracted at a record pace during the quarter that ended March 31, as exports collapsed and companies cut back production. The Japanese gross domestic product shrank 15.2 percent on an annualized basis. It marked a fourth straight quarter of contraction and the biggest decline since Japan began keeping records in 1955. It was also a deeper fall than during the last quarter of 2008, when the economy shrank a revised 14.4 percent on an annualized basis. With shipments overseas down 26 percent from the previous quarter, export-dependent Japan has been harder hit than the United States and Europe as demand evaporated amid the global economic turmoil. The Japanese contraction in the last quarter from the previous quarter — 4 percent — compares to 1.6 percent shrinkage in the United States and a 2.5 percent fall in the euro zone. Update (5/22): Germany: -14.4%, Mexico: -21.5% (annual rates). How Much Carbon Does a Dragon Emit? China’s emissions, which come largely from its coal-burning electricity plants, doubled between 1996 and 2006. That was a much faster pace of growth than in the previous decade. And the trend seems set to continue: In January, China announced that it plans to continue its reliance on coal as its main energy source and that to feed its economic growth it will increase coal production 30 percent by 2015. That’s a decision that, all by itself, will swamp any emission reductions elsewhere. So what is to be done about the China problem? Nothing, say the Chinese. Each time I raised the issue during my visit, I was met with outraged declarations that it was unfair to expect China to limit its use of fossil fuels. After all, they declared, the West faced no similar constraints during its development; while China may be the world’s largest source of carbon-dioxide emissions, its per-capita emissions are still far below American levels; and anyway, the great bulk of the global warming that has already happened is due not to China but to the past carbon emissions of today’s wealthy nations. And they’re right. It is unfair to expect China to live within constraints that we didn’t have to face when our own economy was on its way up. But that unfairness doesn’t change the fact that letting China match the West’s past profligacy would doom the Earth as we know it. Historical injustice aside, the Chinese also insisted that they should not be held responsible for the greenhouse gases they emit when producing goods for foreign consumers. But they refused to accept the logical implication of this view — that the burden should fall on those foreign consumers instead, that shoppers who buy Chinese products should pay a “carbon tariff” that reflects the emissions associated with those goods’ production. That, said the Chinese, would violate the principles of free trade. Sorry, but the climate-change consequences of Chinese production have to be taken into account somewhere. If blunt-instrument outside pressure like this column makes it more likely that Chinese authorities will keep making progress, then as a pure matter of power-politics I say: fine. But my guess and observation is that it is just as likely to get their back up -- and encourage the ever-present victimization mentality that makes it less rather than more likely that Chinese authorities will behave "responsibly" on the international stage. As I've written a million times (most recently here and here and generally here), arguably the most important thing that will happen on Barack Obama's watch is reaching an agreement with China -- or not -- on environmental and climate issues. We'll see what's the best means toward that end. Tyler Cowen also has objections. Gary Clyde Hufbauer and Jisun Kim discussed the idea of using tariffs as an instrument of climate policy in a Vox post last year. It has a venerable culture. It has growing economic might. But what India doesn't have is a currency symbol that reflects those things, according to its government, which has launched a public competition to find one. Unlike other major currencies such as the U.S. dollar, the British pound, the euro and the Japanese yen, the Indian rupee lacks an easily recognizable identification symbol -- a logo to set beside the $, the £, the € and the ¥. It is currently depicted around the world as either "Rs" or "INR" and is designated differently in various Indian languages. In March, the Finance Ministry called for suggestions for a logo in a nationwide contest. It attracted about 3,000 entries before it closed April 15. We eagerly await the winner. [T]he increase in the unemployment rate, to 8.9 percent from 8.5 percent, wasn’t as bad as it sounds. It was nearly all a shift of people from unofficial unemployment — not working and not looking for a job — to official unemployment. The percentage of adults with jobs remained unchanged, at 59.9 percent. That is, to be counted as "unemployed" people must report that they are looking for work. This may be a sign that some of the people who had given up looking for work - so-called "discouraged workers" - now think its at least worth it to re-enter the job market. Note that the number of jobs (i.e, "nonfarm payrolls") comes from a survey of firms, while the unemployment rate and labor force participation are based on a survey of households, so the numbers do not generally line up perfectly. The household survey actually reported an increase of 120,000 in the number of employed persons. Menzie Chinn notes another hopeful sign that the worst may be over: new claims for unemployment insurance are falling. The Cleveland Fed has put together a useful tool to track all the action on the Fed's balance sheet, which has suddenly become very interesting: This comes to my attention via Economix, which discuses some of the implications. The alarming collapse of world trade volumes has not been spread evenly around the world. At Vox, Kioyasu Tanaka argues that vertical specialization - the division of production processes among different countries - can help explain why Japan has seen a sharper drop in trade than the US. I hadn't seen the other part of this until now; but wow, that's misguided... He's got a tie, but I'm wearing glasses. I win. Not quite sure why I said potential severity... it's pretty bad now. (Print version of story here). As a rule, there are two ways to get a reputation in Washington for being “thoughtful,” neither of which requires having a lot of ideas rattling around in your head. In fact one method is to avoid, as much as possible, any ideas beyond a general desire for everyone to sit down in good faith and a cooperative spirit and reason things out. Alternatively, you can simply be “unpredictable.” The more you can surprise people with your position on an issue, more thoughtful you are considered to be. This technique has served Arlen Specter, to choose a currently newsworthy example, well over the years. Jack Kemp was not unpredictable, and he did not strike poses of moderation and statesmanship. He might be accused of a third device: Like Gary Hart on the Democratic side, he was deeply committed to the idea of ideas, as opposed to ideas themselves. And if he mentioned, say, Say’s Law (a famous principle of economics), he was likely to offer up the author’s full name -- Jean-Baptiste Say -- as a way to establish his bona fides. But Kemp did have one idea that he was introduced to in the mid-1970s, stuck with, and saw triumph. That, of course, is supply-side economics, and in particular its policy prescription: cut taxes and you will increase government revenues. Among Republicans, this became more like a religion than a policy, with all the fixin’s: miracles, saints (Ronald Reagan, Arthur Laffer, Kemp) and total immunity from factual refutation. Kemp probably went to his grave believing that this victory was an intellectual one -- a triumph of persuasion. In fact, it was an example on the other side of the argument: that material forces, not ideas, are what move history. One of the few senior Republicans to try to undo the curse of Richard Nixon, Jack Kemp 1935-2009 was a pillar of and an ornament to the American republic. Howard Gleckman emphasizes the positive: Kemp's role in the 1986 tax reform. Kemp's former staffer, Bruce Bartlett looks back at the Kemp-Roth bill, which became the centerpiece of "Reaganomics." The NY Times obituary has more on Kemp's football and political careers.